With overall participation of 33 percent, Emory's employee health screenings held in January and February were a great success, Human Resources reports. 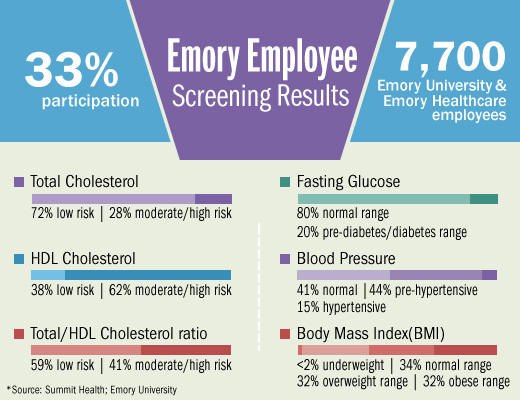 The screenings, which measured key biometric numbers such as blood pressure, cholesterol, glucose and height/weight, served over 7,700 employees of Emory University and Emory Healthcare, providing them with important information about their current health status and referrals to Emory resources for health improvement opportunities. "It's great that so many Emory employees are taking an interest in their health. And we're very pleased that participating in the screening has been a positive experience for them," says Michael Staufacker, director of Health Management. "Ninety-nine percent of those who participated in the screenings indicated that it was a valuable benefit. More importantly, 93 percent of participants reported increased knowledge about their own health, and 92 percent indicated increased motivation to take action to improve their health." Summit Health, the third party vendor that conducted Emory's screenings, summarized the screening data in an aggregate report to help Emory better understand the current health status of the employee population. These report findings will assist Emory in designing programs to address the health needs of employees. They will also serve as a baseline for measuring the effectiveness of programs. "By offering the screenings, we wanted to increase health awareness and encourage employees to take advantage of the many health-related programs available to us at Emory," Staufacker explains. "Our 2013 wellness program helps address the key risk factors and behaviors that are related to blood pressure, cholesterol and weight. Whether you are interested in improved eating, increased physical activity and movement, tobacco cessation, or stress management, there is something for you in our wellness program." Those who missed the onsite screenings still have options to participate: they can receive a screening at their physician's office or they can make an appointment with Emory Healthcare's Employee Health Services. For more details on these options, visit the Health Screening website. By participating in both a health screening and an online health assessment, Emory employees can earn either a $100 credit against their deductible/co‐insurance (POS Plan members) or a $200 contribution to their health savings account (HSA Plan members). It takes about four to six weeks to process incentives. Some employees who participated in the onsite screenings have not yet taken their online health assessment. "We want to make sure everyone has an opportunity to earn their medical plan incentive; it's a two-step process to earn this incentive," Staufacker says. The online questionnaire takes about 15 minutes to complete and participants will receive immediate feedback on their health habits and risks, including a health score. Employees can take the health assessment at www.aetna.com. Staufacker stresses that while knowing your numbers and potential health risks are important, putting that knowledge to practical use is what can change your life. "We hope that with easy access to health screenings and the online health assessment, along with a variety of wellness initiatives, our employees will be able to make healthier lifestyle choices and set personal goals for health improvement. By working together, we can make this a 'Healthy Emory!'"